Mother Teresa of Calcutta Read and Recommended Maria Valtorta! Mother Teresa of Calcutta Read Maria Valtorta and Recommended Her Writings! Mother Teresa of Calcutta is world-famous for founding the Missionaries of Charity, consisting of over 4,500 religious sisters serving the poorest of the poor in 133 countries. She was the recipient of the 1979 Nobel Peace Prize, beatified in 2003, and canonized in 2016. She was an inspiration and role model to thousands of people around the world. What is interesting for us is that one of the books most dearest to her and that she often carried with her in her travels was none other than Maria Valtorta’s The Poem of the Man-God. Fr. Leo Maasburg, National Director of the Pontifical Mission Societies in Austria, was a close associate of Mother Teresa of Calcutta. He accompanied her on many of her journeys, was present at the occasion of the opening of new Missionaries of Charity houses on multiple continents, and preached retreats for her sisters all over the world. When Mother Teresa opened her first houses in Moscow and Armenia in 1988, Fr. Maasburg was their spiritual counselor for several months and through these means was the first official Catholic priest allowed back into the Soviet Union. He published a book about Mother Teresa in October 2011 that relates 50 eyewitness stories about her life and accomplishments. According to a report by Fr. Leo Maasburg, national leader of the missions in Vienna, Austria and an occasional confessor of Mother Teresa for 4 years, she always traveled with three books: The Bible, her Breviary, and a third book. When Fr. Leo asked her about the third work, she said to him that it was a book by Maria Valtorta. Upon his inquiries about the content of it, she told him, "read it" and simply repeated that. Recently interviewed by Christian Magazine on the advice of Mother Teresa on the work of Maria Valtorta, Fr. 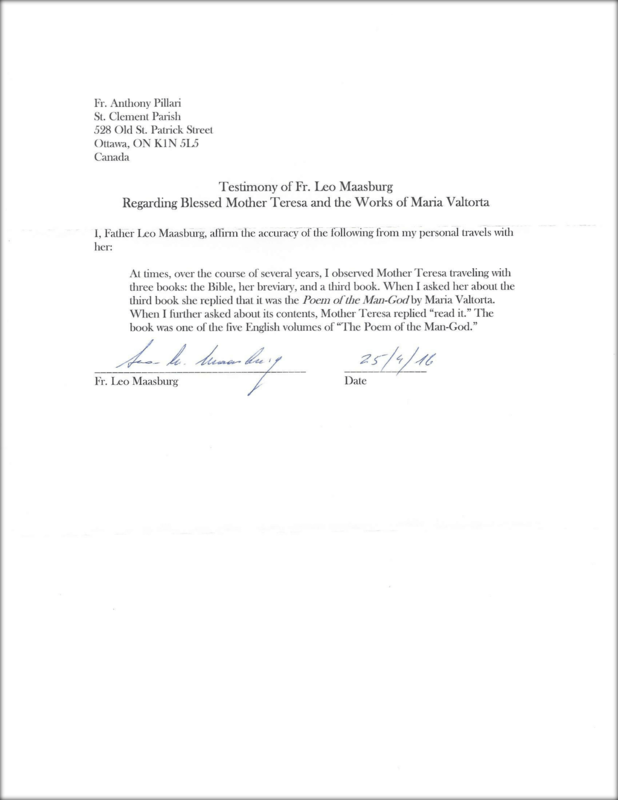 Leo Maasburg simply confirms: "For what is the attitude of Mother Teresa about Valtorta, I clearly remember her positive reaction without recalling more details". (Extract from Christian Magazine, No. 218 of 03/15/2009, page 5). This was further confirmed in a 2017 JCL thesis published for the Faculty of Canon Law of St. Paul University which includes a signed testimonial letter of Fr. Leo Maasburg. In this signed testimony, Fr. Maasburg testifies that Mother Teresa carried Maria Valtorta’s The Poem of the Man-God with her in her travels, read this work, and recommended him to also read it. A description of this JCL thesis and a link to download it is available here: JCL Thesis: The Current Juridic and Moral Value of the Index of Forbidden Books (with Maria Valtorta Case Study). Considering that Mother Teresa’s charity towards the poor and selflessness (which served to unite her to Christ in a special way) was quite extraordinary, her special devotion to reading Maria Valtorta’s The Poem of the Man-God is a tremendous testimony. I drew this image for Mother Teresa in 1996. 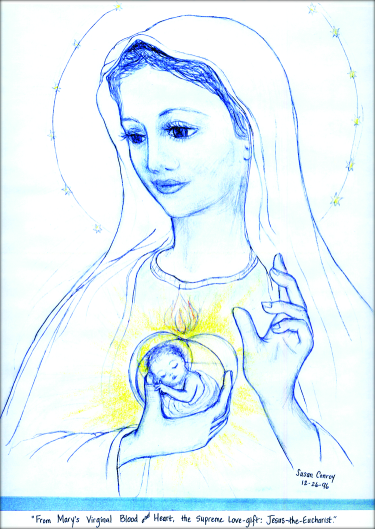 It is a drawing of Our Blessed Mother Mary holding the Sacred Host within her Immaculate Heart. Within the Host appears Her Divine Child, Jesus. The whole idea for this drawing (and the caption underneath it) came from a book titled: The Virgin Mary in the Writings of Maria Valtorta, by Fr. Gabriel M. Roschini, O.S.M. That book relates that Our Lady appeared to Maria, an Italian mystic, and said: I would like someone to draw a picture of Me as I appear to you now. My Immaculate Heart should shine with heavenly light and contain the Most Blessed Host, in which the Divine Child is to be pictured. Underneath, put the inscription: ‘From Mary’s Virginal Blood and Heart, the Supreme Love-Gift: Jesus-the-Eucharist.’ (Our Lady spoke this to Maria Valtorta on June 4th, 1953, on the Feast of Corpus Christi). Mother Teresa wrote to me just weeks before she died and assured me: I did receive your picture It is still hanging on my wall. Our Lady of the Blessed Sacrament Icon Drawn Based on Maria Valtorta’s Writings. Mother Teresa of Calcutta is another noteworthy witness to the greatness of Maria Valtorta’s writings, especially in its usefulness for inspiration for missionary and charitable work, personal sanctification, and its importance among books for spiritual reading and meditation. She is a significant witness, having found the Missionaries of Charity, consisting of over 4,500 religious sisters serving the poorest of the poor in 133 countries for which she also received the 1979 Nobel Peace Prize, was beatified in 2003, and canonized in 2016. Mother Teresa of Calcutta is not the only canonized or beatified religious who has approved, endorsed, or praised Maria Valtorta's work. 1. They Speak of Maria Valtorta. Maria-Valtorta.org. 2006. 2. Artwork Created for Mother Teresa. Susan Conroy. 2011. Accessed online November 2017.